PREMISES: The warehouse and office and showroom areas shown as on the plan attached hereto as Exhibit A ("Plan") in the building ("Building") commonly known as ____________________ together with the use, in common with others, of any common areas of the Building, including, but not limited to, entryways, sidewalks, driveways and parking areas. The Building has ____ parking spaces available, or ____ parking spaces per ____ rentable square feet of the Building. The land ("Land") upon which the Building is located the Building and the parking spaces are shown on Exhibit A-1 attached hereto. PREMISES RENTABLE AREA: Approximately _____ sq. ft. (determined by Landlord's architect, after completion of perimeter walls, using ANSI/BOMA Z65.1 - 1996 Standard). PERMITTED USE: Storage, office, processing of food products, distribution of restaurant goods and supplies and related products and uses ancillary thereto. DELIVERY DATE: The date established under Section 2.1. TERM OF LEASE: Ten (10) years plus any fraction of a month in which the Delivery Date shall occur if-the Delivery Date shall not occur on the first day of the month (unless sooner terminated pursuant to the Lease). The Reference Page information is incorporated into and made a part of the Lease. In the event of any conflict between any Reference Page information and the Lease, the Lease shall control. This Lease includes Exhibits A through F, all of which are made a part of this Lease. 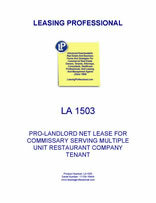 By this Lease Landlord leases to Tenant and Tenant leases from Landlord the Premises described on the Reference Page. The Reference Page, including all terms defined thereon, is incorporated as part of this Lease. 1. USE AND RESTRICTIONS ON USE. 1.1 The Premises are to be used solely for the Permitted Use stated on the Reference Page. Tenant shall not do or permit anything to be done in or about the Premises which will be used for any unlawful purpose. Tenant shall not do, permit or suffer in, on, or about the Premises, the commission of any waste. Tenant shall comply with all governmental laws, ordinances and regulations applicable to the use of the Premises and its occupancy and shall promptly comply with all governmental orders and directions for the correction, prevention and abatement of any violations in or upon, or in connection with, the Premises, all at Tenant's sole expense, but excluding those responsibilities of Landlord pursuant to Sections 6.1, 7.1 and 38 hereof. Tenant shall not do or permit anything to be done on or about the Premises or bring or keep anything into the Premises which will in any way increase the rate of, invalidate or prevent the procuring of any insurance protecting against loss or damage to the Building or any of its contents by fire or other casualty or against liability for damage to property or injury to persons in or about the Building or any part thereof. 1.2 Tenant shall not, and shall not direct, suffer or permit any of its agents, contractors, employees, licensees or invitees to at any time handle, use, manufacture, store or dispose of in or about the Premises or the Building any (collectively "Hazardous Materials") flammables, explosives, radioactive materials, hazardous wastes or materials, toxic wastes or materials, or other similar substances, petroleum products or derivatives or any substance subject to regulation by or under any federal, state and local laws and ordinances relating to the protection of the environment or the keeping, use or disposition of environmentally hazardous materials, substances, or wastes, presently in effect or hereafter adopted, all amendments to any of them, and all rules and regulations issued pursuant to any of such laws or ordinances (collectively "Environmental Laws"), nor shall Tenant suffer or permit any Hazardous Materials to be used in any manner not fully in compliance with all Environmental Laws, in the Premises or the Building and appurtenant land or cause the environment to become contaminated with any Hazardous Materials. Notwithstanding the foregoing, Tenant may (i) handle, store, use or dispose of products containing small quantities of Hazardous Materials (such as aerosol cans containing insecticides, toner for copiers, solvents, paints, paint remover and the like) to the extent customary and necessary for the use of the Premises for general office purposes and in connection with the Permitted Use; (ii) provide on-site, mobile fueling for Tenant's vehicles, subject to any approvals which may be required by the Town of ___________, and (iii) wash its vehicles, subject to any necessary approvals from the Town of ___________; in each case provided that Tenant shall always handle, store, use, and dispose of Hazardous Materials in a safe and lawful manner and never allow such Hazardous Materials to contaminate the Premises, Building or appurtenant land or the environment in violation of Environmental Laws. Tenant shall protect, defend, indemnify and hold each and all of the Landlord Entities (as defined in costs and reasonable attorney's fees) incurred by reason of any failure of Tenant to fully comply with all applicable Environmental Laws, or the presence, handling, use or disposition in or from the Premises of any Hazardous Materials (even though permissible under all applicable Environmental Laws or the provisions of this Lease) caused by Tenant or its agents or invitees except to the extent of Landlord's obligations pursuant to Section 38 hereof, or by reason of any failure of Tenant to keep, observe, or perform any provision of this Section 1.2. Landlord represents that the Land is currently free of environmental contamination (and in compliance with all Environmental Laws) and shall indemnify Tenant and be responsible for any costs of remediation of any environmental contamination, should any be discovered to have been existing at the Land as of the date hereof. 1.3 Landlord shall provide Tenant, as appurtenant to the Premises and without extra charge, (i) with the use, in common with others in the Building, of the common area parking servicing the Premises which is a ratio of at least ____ parking spaces for each 1,000 rentable square feet of the Building. Tenant shall have truck access to drive around the Building and park at its loading docks. Landlord agrees to proceed as soon as possible and to use diligent efforts to obtain a modification to the site plan approval and any other permits necessary to change the truck parking as shown on the Modified Site Plan attached hereto as Exhibit C and shall allow Tenant the opportunity to participate in this process. 2.1 The Term of this Lease shall begin on the delivery date ("Delivery Date") which shall be the later to occur of (a) the Scheduled Delivery Date shown on the Reference Page, and (b) the date when Landlord shall tender possession of the Premises to Tenant with Landlord's Work described on Exhibit B attached hereto substantially completed (but for punch list items that do not materially interfere with Tenant's ability to use the Premises for the Permitted Use) and all mechanical, plumbing and utility systems in working order and available for Tenant's immediate use, and Landlord shall have provided Tenant with a certificate of occupancy (or temporary certificate of occupancy) from the Town of ___________, _________ with respect to the Premises. Landlord agrees to use reasonable and diligent efforts to obtain a certificate of occupancy and deliver the Premises to the Tenant. As soon as it shall be determined, Landlord and Tenant shall execute a memorandum in recordable form setting forth the actual Delivery Date and Termination Date. In the event the Delivery Date shall not have occurred by ______, 20___ for any reason other than the fault of Tenant, Tenant shall receive a credit against its first rental payments due hereunder at the rate of $________ for each two (2) days by which the Delivery Date is extended beyond ______, 20___. If the Delivery Date shall not have occurred by ______, 20___ for any reason other than the fault of Tenant, Tenant shall receive a credit against its first rental payment due hereunder at the rate of $________ for each day by which the Delivery Date is extended beyond ______, 20___. If the Delivery Date shall not have occurred on or before ______, 20___, Tenant shall have the right to terminate this Lease upon ten (10) days written notice to Landlord. 2.2 Notwithstanding any provision of this Lease to the contrary, Annual Rent and all other charges due under this Lease shall begin on the Rent Commencement Date which shall be the Delivery Date. 2.3 After the Lease Reference Date, and only after Landlord's prior consent and scheduled so as not to interfere with Landlord's Work at least four (4) weeks prior to the Delivery Date, Landlord shall afford Tenant reasonable access to the Premises in order for Tenant to install telecommunication (which may include a satellite dish(es) upon the roof of the Building, where designated by Landlord, at Tenant's expense and responsibility for any damage which the installation or maintenance of the same may cause to the roof of the Building) and computer wiring and equipment and other furniture, fixtures, warehouse racking and equipment. In the event Landlord shall permit Tenant to occupy the Premises prior to the Delivery Date, such occupancy shall be subject to all the provisions of this Lease other than the payment of Rent and Additional Rent and shall not advance the Termination Date. 2.4 Option to Extend. Tenant shall have two (2) options to extend the Term for a period of five (5) years each following the end of the existing Term, so long as no uncured Event of Default by Tenant exists during the period from the time of the exercise of this option until the end of the Term. Such options may be exercised by notice from Tenant to Landlord given not less than twelve (12) months prior to the expiration of the Term. Upon the giving of such notice, this Lease and the Term hereof shall automatically be extended for five (5) years without the necessity for the execution of any other instrument in confirmation thereof except for a document memorializing the Annual Rent established as set forth in Section 3.3 below for the extended Term and an amended notice of lease to be signed by the parties suitable for recording that Tenant may register or record at its cost and expense. Except for the rent payable during the option period, which shall be determined in the manner provided in Section 3.3 below, and the fact that there shall be no further option to extend, each extension shall be upon all the same terms, conditions and provisions as contained in this Lease. Whenever the context shall not be inconsistent therewith, references in this Lease to the Term hereof shall be deemed to include the option period for which the original Term shall then be so extended. 2.5 Contiguous Space Expansion Option. Landlord agrees that it will not, during the Term of this Lease, lease any space in the Building which is contiguous to the Premises ("Contiguous Space") without first offering the same to Tenant upon the same terms and conditions as Landlord would be willing to lease to a third party. If Landlord intends to lease Contiguous Space, Landlord shall first provide written notice of such terms and conditions to Tenant ("Landlord Notice") and Tenant shall have a period of ten (10) days from receipt of Landlord's Notice within which to agree to lease such Contiguous Space upon the exact same terms and conditions as set forth in Landlord's Notice. If Tenant shall notify Landlord of its desire to lease the Contiguous Space within such ten (10) day period, then this Lease shall be modified to include the Contiguous Space upon the same terms and conditions as set forth in this Lease, except as the same may be modified with respect to the Contiguous Space by the terms set forth in Landlord's Notice. If Tenant shall fail to accept the offer contained in Landlord's Notice within such ten (10) day period, then Landlord shall be free to lease the Contiguous Space to a third party on terms and conditions no more favorable to any third party than those set forth in Landlord's Notice. 3.1 Tenant agrees to pay to Landlord the Annual Rent in effect from time to time by paying the Monthly Installment of Rent then in effect on or before the first day of each full calendar month during the Term, except that the first month's rent shall be paid upon the Delivery Date. The Monthly Installment of Rent in effect at any time shall be one-twelfth of the Annual Rent in effect at such time. Rent for any period during the Term which is less than a full month shall be a prorated portion of the Monthly Installment of Rent based (except as otherwise set forth in this Lease) upon a thirty (30) day month. Said rent shall be paid to Landlord, without deduction or offset and without notice or demand, except as may be required by Section 19.7, at the Landlord's address, as set forth on the Reference Page, or to such other person or at such other place as Landlord may from time to time designate in writing. 3.2 Tenant recognizes that late payment of any rent or other sum due under this Lease will result in administrative expense to Landlord, the extent of which additional expense is extremely difficult and economically impractical to ascertain. Tenant therefore agrees that if rent or any other sum is not paid within seven (7) days of the date when due and payable pursuant to this Lease, a late charge shall be imposed in an amount equal to four percent (4%) of the unpaid rent or other payment. The amount of the late charge to be paid by Tenant shall be reassessed and added to Tenant's obligation for each successive monthly period until paid. The provisions of this Section 3.2 in no way relieve Tenant of the obligation to pay rent or other payments on or before the date on which they are due, nor do the terms of this Section 3.2 in any way affect Landlord's remedies pursuant to Article 19 in the event said rent or other payment is unpaid after date due. 3.3 If Tenant shall extend the Term pursuant to Section 2.4 above, Tenant shall pay Annual Rent during each extension of the Term equal to the greater of (a) Market Rent, as defined below, or (b) the Annual Rent in effect upon the last day of the Term existing prior to the extension period in question. "Market Rent" shall be computed for the option period at the then effective current rentals being charged to new tenants in buildings of comparable type, build-out and quality to that of the Premises, in the same rental market area as that of the Premises, taking into account and giving effect to, in determining comparability, without limitation, such considerations as size, location of premises, lease term, whether or not there will be a brokerage commission charged, and Real Estate Tax and Operating Expense charges to the tenant. Landlord and Tenant shall use best efforts to agree on the Market Rent no later than thirty (30) days after Landlord receives Tenant's notice of its intent to extend the Term. In the event Landlord and Tenant cannot so agree, Landlord shall provide Tenant with notice as to its designation of Market Rent ("Landlord's Designation") for the five year option period in question no later than thirty (30) days after receiving Tenant's notice of its intention to extend the Term and shall furnish comparable data in support of such designation. If Tenant disagrees with Landlord's Designation of the Market Rent, then Tenant shall have the right, by written notice given within thirty (30) days after Tenant's receipt of Landlord's Designation ("Tenant's Arbitration Notice"), to submit the determination of Market Rent to arbitration as follows. Market Rent shall be determined by appraisers, one to be chosen by Tenant, one to be chosen by Landlord, and a third to be selected, if necessary, as below provided. All appraisers selected under this paragraph shall be experienced, M.A.I. real estate appraisers with at least 10 years experience with properties in the Greater _________ Area and shall not have been employed by the party choosing such appraiser in the prior five (5) years. Within twenty-one (21) days after Tenant's Arbitration Notice, the parties shall each designate its own appraiser and notify the other of its chosen appraiser. Unless such two appraisers shall have reached a unanimous decision within thirty (30) days after their designation, then they shall so notify the then President of the Greater _________ Real Estate Board and request him or her to select an impartial third appraiser to act hereunder. Such third appraiser shall receive submittals of the determination of Market Rent from each of Landlord's and Tenant's appraisers with accompanying data to support their determination. Within fifteen (15) days after receipt of such information from Landlord's and Tenant's appraisers, the third appraiser shall determine Market Rent only by selecting one or the other of the two appraisals without modification. The decision of the third appraiser as to which appraisal the third appraiser believes to be closest to Market Rent shall be final and binding upon the parties. Landlord and Tenant shall each bear the expense of their own appraiser and shall bear the expense of the third appraiser (if any) equally. 4.1.1 LEASE YEAR: Each calendar year falling partly or wholly within the Term.